Can we hope for world peace in the current plight of world affairs? 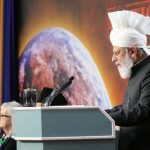 At the 10th Peace Symposium UK; His Holiness, Mirza Masroor Ahmad (aba) sets out a stark message and calls on all peoples to take urgent action. The Worldwide Head of the Ahmadiyya Muslim Community and Fifth Khalifah, Hazrat Mirza Masroor Ahmadaba, has spoken at length about the perilous state of the world and the impending threat of a nuclear war. 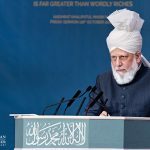 Whilst delivering the keynote address, on the occasion of the 10th Annual Peace Symposium at the Baitul Futuh Mosque in London, His Holiness warned of catastrophic consequences if true justice at all levels was not observed. He said the risk of a nuclear war was real and was the biggest threat to today’s civilisation. 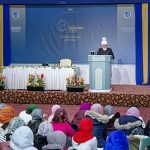 During his keynote address Hazrat Mirza Masroor Ahmadaba spoke about the need for peace and justice; the escalating conflicts in the Far East; the war in Syria and the increasing risks of a global, nuclear war. He also offered a solution for global unrest based on the teachings of the Holy Qur’an. The event attracted an audience of more than 1000 people, including Government Ministers, Ambassadors of State, Members of both Houses of Parliament and various other dignitaries and guests from all walks of life. The theme of this year’s Symposium was ‘The Pathway to Peace’. 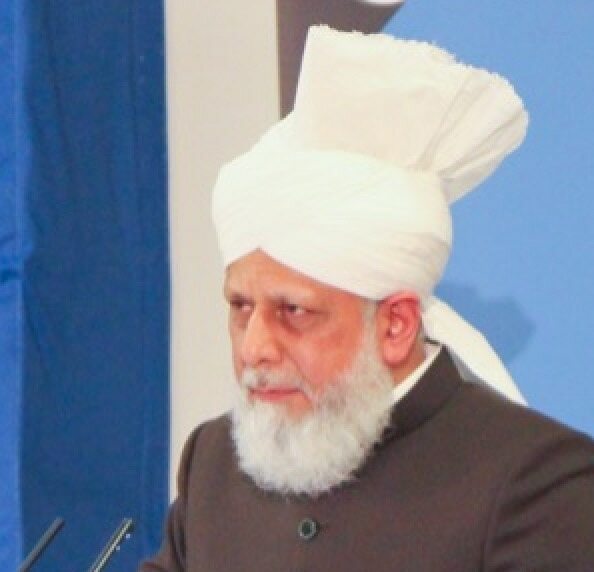 Keynote Address delivered by Hazrat Mirza Masroor Ahmadaba, Khalifatul Masih V, Head of the worldwide Ahmadiyya Muslim Community on 23rd March 2013 at the 10th Peace Symposium UK, at the Baitul Futuh Mosque in London. I would firstly like to thank all of you, our respected guests, for accepting our invitation to attend today’s Peace Symposium. All of you, whether attending for the first time or if you are our old friends, are very welcome. We are truly grateful that you have enlightened this event with your presence. The majority of you are non-Muslims and so I particularly appreciate your gesture in coming, considering that you are all aware that the Ahmadiyya Community is an Islamic sect. Generally speaking, attending the function of another group irrespective of religious differences is not rare or all that significant. We often find people who despite differences of belief are able to develop very close friendships with one another, due to their open hearts and broad-mindedness. Nonetheless, there are a number of reasons why your attendance is particularly praise-worthy and significant. Firstly, the very fact that you have accepted the invitation of a Muslim group is significant. 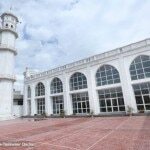 Secondly, the fact that you are willingly attending a function taking place within the complex of a mosque is noteworthy and thirdly, the acts of certain so-called Muslims have led to fears or reservations developing in the hearts of many non-Muslims. Bearing all of this in mind, we extremely appreciate that you have taken this kind and considerate step. Our old non-Ahmadi friends are well aware that the Ahmadiyya Community practices exactly what it preaches and that whatever we say and do is based on true Islamic teachings – which are of ‘Love for All, Hatred for None’. However, as I have said, we also have some new friends in attendance today and it is quite possible that they may harbour some doubts or suspicions about us or about Islam, and so I would like to reassure them from the outset. The truth is they will hardly find anyone or any group who is more opposed to cruelty, extremism and injustice as we Ahmadi Muslims are. To establish the highest standards of love, affection and brotherhood are our objectives. With these words of introduction I now turn towards the main theme of tonight’s event. 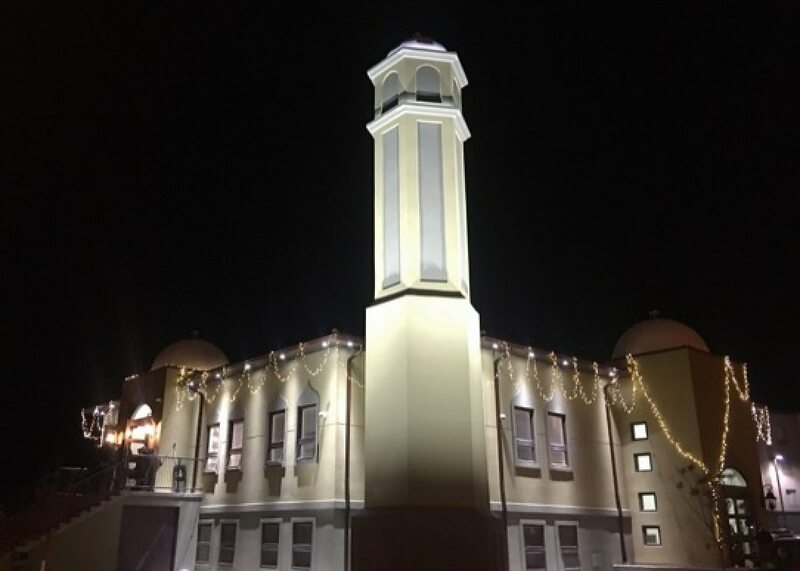 Each year, the Ahmadiyya Muslim Jama’at in the United Kingdom organises this function as a means to express and show the people of the world that we desire and strive for a world filled with peace. In order to attain this wonderful objective we also require your help and support. Thus today, we have joined together to remind ourselves about the importance of this aim. To strive for peace is a noble ambition and is something that the world has always stood in great need of. If we look at the situation of the world today, we realise that now, more than ever, it is a pressing and urgent need of the time for us to seek and pursue peace and harmony in the world. During the past four or five years, the various disasters and forms of unrest that have occurred or are occurring, have led directly to an increase in restlessness and disorder. There is no doubt that with each day that passes the peace of the world is ebbing away. We cannot attribute the world’s lack of peace on just one or two factors. In fact there are multiple factors which are all contributing to the increasing disorder. I shall name just a few. The world’s economic crisis has contributed hugely to global unrest and increased frustrations amongst the masses. Another major cause of division is internal power struggles within countries. Then, in many nations, the rights due to members of the public are being unjustly usurped. Another factor is that some parties seek to demonstrate their power and might by treating others extremely cruelly. Further, a root cause of division is a lack of justice in the world. This is leading directly to a complete lack of mutual confidence and trust. Another cause of unrest is the fact that people or governments look at the wealth and resources of others with a sense of envy and greed. In fact, they do not limit themselves to envious glances, but actually seek to seize what is not rightfully theirs. World economic crisis has contributed to global unrest and increased frustration amongst the masses. As I said, there is a long list of reasons why the world is being consumed by hatred and disorder and I have only mentioned a few. These issues are of grave concern and we must reflect over how to solve them, so we can seek to establish global peace. Enmities and differences are increasing daily and are rapidly spiralling out of control. The state of the world is going from bad to worse. Something which has been said in the past, which is very true, is that whilst it is extremely difficult to make a good friend, it is very easy to make an enemy. If we look at the world today, we find that from the very smallest scale of society, to a national and international level, these are the circumstances that are prevalent. Not only do people espouse hatred and carry out evil acts but they are also inciting others towards such cruelties and oppression. On the one hand, the numbers of those who are causing conflicts is ever-increasing, whilst on the other hand the numbers of people who are actually acting with justice, good morals and trying to bring about reconciliation, is ever-decreasing. With this backdrop, I say again, that the Ahmadiyya Community remains constantly engaged in striving for a better society and so today’s event is also being conducted in an effort to promote true and long-lasting peace. For the past five or six years, I have warned all of those within my reach, about the deteriorating state of the world. I have repeatedly said that the worsening financial and political climate is leading the world towards the most horrific destruction. It is quite possible, and even likely, that the path the world is treading will culminate in a terrifying world war. More than sixty-five years have passed since the last world war and I fear that people have forgotten the unparalleled levels of devastation and destruction that it caused. In that global war, more than 70 million people were killed – the majority of whom were innocent people, who were dragged into the war unwillingly. Just a few months after last year’s Peace Symposium, I travelled to the United States and was invited to address members of Congress at Capitol Hill. Apart from the politicians, a number of important think-tanks and academics were also in attendance. In my address to them, I said that as the world’s biggest superpower, the United States had to consider its responsibilities to the wider world. I said that if they failed to fulfil their obligations and if they failed to observe the proper standards of justice, then they would lead the world towards a terrifying destruction. I said that the coming generations would lay the blame at the feet of us and in particular the major powers of this time. Our children or grandchildren would not forgive us because they would know that we could have prevented the harrowing legacy that we left behind for them. Similarly, last December, at the European Parliament in Brussels, our good friend who has just spoken as well, Dr Charles Tannock MEP, organised an event in which I was able to address members of the European Parliament. Also in attendance were MPs from various national parliaments and a range of other dignitaries and influential people. I took the opportunity to remind the European countries of their responsibilities as member nations of the European Union. I have delivered the same message calling for peace and justice. On many occasions in different parts of the world I do the same. I do not know how much impact my views have had on those who have listened to me and I am not aware to what extent they are working towards developing peace within their own circles of influence. Nevertheless, I will, God Willing, always continue to carry out my task and my responsibilities of promoting peace, tolerance, justice and compassion to the corners of the world. I will continue to tell all people that in order to be relieved of the pain and suffering that we face today, we must adopt true justice and equality. What is actually meant by justice and what does it require? I shall now answer this question based entirely on the teachings of the Holy Qur’an. The Qur’an teaches us that all people must display absolute justice and bear witness in the name of Allah, even if they are forced to give evidence against themselves, their parents or their loved ones (Chapter 4, Verse 136). Further, the Qur’an teaches that a person must not let the enmity or hatred of any nation incite them to act unjustly, rather they should always act in a fair and equitable manner, because that is the standard required by our Loving God (Chapter 5, Verse 9). In order to develop peace, it is necessary that we first establish these standards of justice. However, when we analyse today’s world, we find that such moral standards are not being implemented at any level. Indeed, it is with regret that I have to admit such standards of fairness have been long forgotten even by the vast majority of Muslims to whom these teachings were given. We neither find this standard of justice between people in society, nor in terms of the relationship between the general public and their governments. Similarly, such high standards are not visible in international relations. It would prove extremely difficult to find even one person who is willing to give evidence against himself or his loved ones, in order to uphold the true requirements of truth and justice. 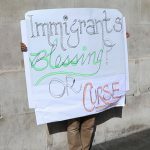 In the same way, it would be almost impossible to find a country that acts entirely fairly with another nation with whom it is in dispute or considers to be an enemy. Keeping all of this in mind, if we want true peace and if we want to save the world from destruction then we must act with justice, integrity and be ever faithful to the truth. If we want our children and future generations to look back at us fondly, rather than with anger that we left them disabled and handicapped, we must act in accordance with the standards of equity I have spoken of. If we fail to do so then there will be nowhere left to hide and no escape from destruction. Whilst it is true that current indications suggest that a world war is likely to ignite from Asia, the truth is that the West will not be able to stay away from it. To illustrate this point, we should look at the escalating conflict between North and South Korea. Their relations are fast deteriorating, but even though it lies thousands of miles away, the United States has become directly involved. North Korea has threatened not just South Korea, but also America. North Korea is known to have nuclear weapons and has not been shy in threatening to use them. It appears that North Korea does not really care about or understand the consequences of its actions and is trigger-happy. This is why just last week, the United States announced it was strengthening its missile defence system on its West Coast. All major parties, including Russia and China, have recently condemned North Korea, although the long term views of these two countries are not entirely clear. Another example of conflict is visible if we look at the relations between China and Japan. Over the past few months a dispute over who owns a series of islands in the East China Sea has intensified. Again we cannot say that this dispute will be limited to the two countries, rather it is quite possible that America will become involved in this conflict as well. Whilst the United States has publicly called on both countries to show patience and restraint, its real sympathies lie with Japan. The America-Japan alliance is such that if a war between China and Japan were to take place, the United States would actively side with Japan. Over the past few months a dispute over who owns a series of islands in the East China Sea has intensified. Today, a major tactic used to try and harm enemy nations is to target their trade and business interests. The world today is not the same world it was fifty or sixty years ago. Even back then, the acts of one nation affected others, however today it is at a completely different level, as the world has become extremely closely knit and inter-dependent. China is emerging as an ever-growing, progressive, economic might and is expected to become the world’s largest (economy) in the coming years. Its economic might is so strong that commentators have said that its power is causing great concern to the United States. Indeed, it has been rightly said that the United States will seek to halt China’s economic progress and will leave no stone unturned in this effort. Given this, it is possible that China will be somewhat cautious and show restraint in its dispute with Japan but there are no guarantees to this. Sometimes when weaker parties are threatened or cornered, there often comes a time when they see no route of escape other than through aggression and so they become even more dangerous. Perhaps because of foreseeing, and considering America’s attitude and policy and its ultimate possible effect on other Western countries, China has started exploring new markets. As in recent years we see that China has invested a great deal in Africa and developing countries and so its economic interests in that part of the world are widespread and deeply ingrained. As a side note, I should also say that if African countries realise their importance, it is quite possible then that in the event of a war between Western and Asian countries, Africa could become a place of safety and refuge. It is extremely likely that if a world war takes place, nuclear weapons will be used. The effects of atomic warfare are beyond our imaginations. In the same way today, the desperate state of affairs in Syria also seems to be leading us down a path towards something far wider and even more devastating. It apparently remains a war between government forces and opposition rebels, yet we are fast approaching a death toll of 100,000 people. A number of powerful countries think that if the opposition rebels prove to be victorious and were able to form a government then the situation in Syria will suddenly stabilise. They believe that the conditions of the Syrians and the relations between the Syrian Government and the international community would improve. However, if we look at the recent examples of Libya and Egypt after their so-called ‘revolutions’ we should realise that the situation will not necessarily improve. A sign of this was witnessed already earlier this month when a group of Filipinos who were posted as United Nations peacekeepers were taken hostage by a Syrian rebel group. Further, the rebels say they do not need peacekeepers or food aid, rather they want weaponry such as anti-tank and anti-aircraft missiles. Such acts and statements do not inspire confidence that long-lasting peace is their objective. So what should be done in Syria? If the world sees that cruelty and oppression is continuing to take place and the desperate Syrian people are crying out for help, then the neighbouring countries should unite together in order to stop the cruelty and establish peace. They should not seek to fulfil personal or vested interests but their goal should only be the peace and prosperity of the local people. The Holy Qur’an teaches that when cruelty has been successfully stopped and the aggressor pledges and adopts peace, then undue restrictions should not be enforced as a means to express power and might. Although this key principle particularly applies where one country attacks another, it can actually be applied to all situations in order to establish peace. Unfortunately, Syria is not just a single issue in itself to solve, but a major obstacle in the pursuit of peace is that within Arab nations there is little or no justice. When they do not treat their own citizens fairly, how can they seek to bring justice in other countries? This leads to the conclusion that the entire world is confronted by division and stands on the brink of disaster. No parties will be spared if the situation gets any worse. Eastern countries that have Western support, or Western Governments themselves, will have to bear the effects of the increasingly destructive state of the world. The end result is likely to be a horrific and destructive war. I say once again that such a war will more than likely include the use of non-conventional weapons – meaning nuclear weapons. Amongst all of this there is only one hope and one guarantee of peace and that is for justice to prevail in the same spirit that the Holy Prophetsa has taught, that you prefer for others what you prefer for yourself. If such justice can develop, where each country and each great power prefers for others what it prefers for itself, then we can still find peace. It requires all parties to give truthful and fair testimony and rather than veto power for a select few, there should be true democracy and justice across the board. If these steps are taken then we will find peace between nations and we will find that terrorist organisations will die away and lose all support. 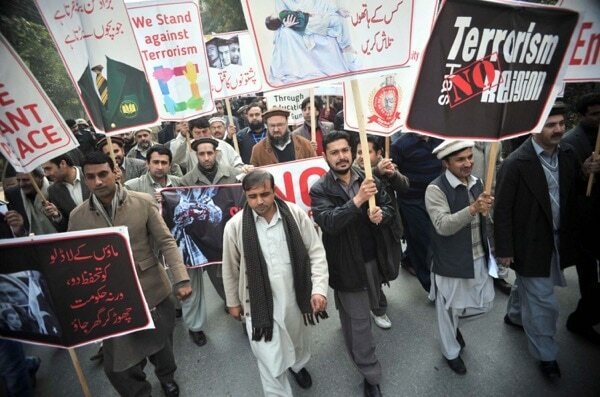 Until recently, the main terrorist groups were based in Afghanistan or Pakistan, but in the past few years we have seen that they have also emerged in some African countries and elsewhere. However, if true peace through justice prevails, then certainly the members of the general public will stand up and forcibly reject extremism and so terrorist organisations will die away. It is a tragic irony that so-called Muslim terrorist groups are defaming Islam, by justifying their hate-filled activities in the name of the religion. The truth is that their Islam has nothing to do with real Islam. The true Islam is a religion of peace that has enlightened the world with its beauty and purity. “Anyone who believes that the eternal issue of war and peace in Europe has been permanently laid to rest could be making a monumental error”. Thus, we should not sit here and only be concerned at the prospect of becoming involved in wars that are taking place in Asia, but we should also be extremely concerned about the problems on our own doorsteps. If we look at Europe’s own financial crisis and its long term effects we see that it is causing restlessness to spread within Europe’s population and this anxiety is increasing at great speed. If not handled properly, the results of such frustrations and desperation will prove to be catastrophic. Thus, it is the duty of all powers to fulfil the requirements of justice and to unite together. All parties need to increase dialogue and open the lines of communication so that they can peacefully discuss the best means to solve the problems of the world. These steps are necessary so that global peace can be established. It is my prayer that Allah grants the people of the world the ability to do this. May Allah bless us all this millennium!